That red really pops! I love the stamps you used on the focal panel. Awesome card! Love how you used that image… and the colors look great. TFS! I really like Kraft and red together (well, kraft with anything, really! ), and I like how you’ve embellished various parts of your sentiment block. Gorgeous card! This is beautiful!! 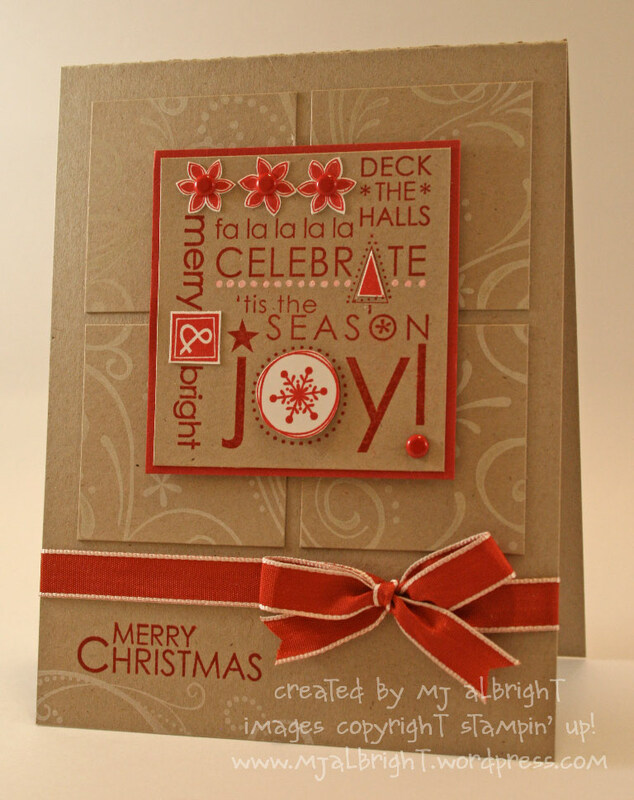 I really love the kraft paper–and the white stamping really makes it soft and pretty!! I love this card!!!! It is absolutely beautiful, soft, and elegant. Great Job! This is gorgeous – I love how the red just jumps off the page! Ok..so this card is fabulous! I love it! I love this color combo. Thanks for sharing! Of course you know this but you are amazing! I love this card and I have that stamp set! Perfect! This turned out so cute, MJ! I love how you embellished the image! I like this one too! The Riding Hood Red with Kraft is an wonderful combination! I love this card! I wish I had all of this stuff so I could case it this minute!! Thanks for sharing! This is just gorgeous and by far my favorite paper is Kraft! I love it Mary Jo!